Festive stories starring much-loved children’s characters. Celebrate Christmas with all your favourite friends! This beautiful seasonal pack brings together a host of the most sought-after characters from TV and classic young fiction, creating a winter wonderland of reading delight. Perfect for sharing, each picture book story explores a familiar aspect of the Christmas celebrations, with an emphasis on snow! What better way to spend Christmas Day than with Winnie-the-Pooh, the Mr Men, Jess the cat and all your other friends? 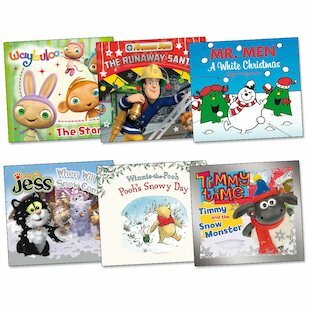 These books make a great gift all together as a pack, or perfect stocking fillers when given individually. How well do you know your Mr. Men? Can you guess who they all are? Brilliant. I really enjoyed reading. It was so, so attracting.